A woman was so scared as she gasped for air in the thick black smoke billowing around her Wednesday afternoon that firefighters say she couldn’t move when they tried to help her out of her burning home in Scott. Yakich and his nephew, firefighter Larry Yakich, also of Engine Company 29, had no other choice but to drag the woman out of the second-floor room and down the stairs where fellow firefighters Lt. Brian Markewinski and Dave Kimak, both of Engine Company 30, helped carry her to safety. The woman, whose name was not available, was taken to a hospital for treatment of smoke inhalation, said Scott police Sgt. Steve Fury. Her brother, Richard Rhoades, 52, who uses a wheelchair, kept trying to get inside the house on Noblestown Road to help his sister, but a neighbor, Kelly Lamb, 32, said she kept pulling him back to safety. 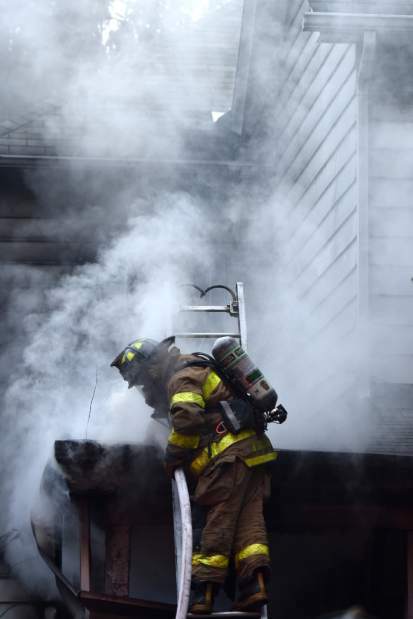 Fury said condemnation proceedings on the house, which is located on the border of the city of Pittsburgh and Scott, were under way before the fire, and East Carnegie fire Chief Adam Kauer said all the utilities had been shut off. “It appears they were trying to stay warm with some type of open-flame device in the kitchen,” Kauer said, explaining that he believes that’s what started the fire. Lamb said she heard Rhoades screaming for help and ran outside to see him in the wheelchair on the porch, the kitchen filled with flames. Lamb’s son, Dammion Bundridge, 12, flagged down a passing motorist, who raised a ladder to the second-floor window to try to help. 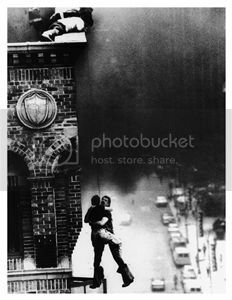 “When the first company arrived, they saw the woman hanging out a side window,” said Pittsburgh Battalion Chief Doug Praskovich. That’s when Yakich and his nephew made their way through the flames and up the stairs. Firefighters from East Carnegie and other township stations then arrived and took over command of the fire. “We had the bulk of the fire knocked down pretty quick,” Kauer said. The fire was confined to the kitchen and another room but there was smoke damage throughout.